Throw on a funky bracelet made from leftover buttons to get everyone smitten by your glamorized wrists. You can combine big, colorful buttons with beads, pearls, or anything that ups your style quotient. Add these 29 pretty wristlets to your ever-growing wardrobe and get set to flaunt your arms. Stringing together a bunch of ordinary buttons gives you a quirky bracelet variety that holds a modest charm no matter what outfit is teamed with it. The red over white and vice-versa buttons weaved into a fun wrist accessory embodies simplicity without going overtly jazzy. The four-holed and two-holed buttons are alternately threaded keeping the larger ones at the ends for easy tying of the knots. 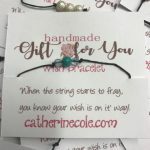 Your best friend deserves some love and what could be a sweeter way than making a bracelet for her. Opt for designer buttons to make it look vivid and glam. Your lookout for a candy arm bracelet ends here. The sparkling buttons wound around the wrist speaks volumes about timeless fashion. Pull the string through a single designer button and tie the knots at the end and you are done with a ravishing bracelet for decking the wrist. Colorful for the spring, it can be given away as a friendship bracelet. Since the number of buttons used is limited, making a bunch and distributing among your pals would make the day even more special. The fabulous wrist accessory has to make it to your jewelry box along with some cool button necklaces as well. The robust paracord is woven into a bracelet with a shiny button at one end and a loop at the other for easy wearing on the hand. Keep your crochet hook ready to work on some leftover buttons making a wrist wrap for adding a bolder texture. 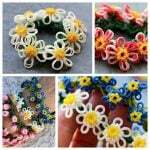 The cohesiveness is maintained using lighter and more soothing hues for the bracelet. Adorned with white pearl buttons the bracelet is one statement piece you cannot part away with simply for its elegance. Vibrant glass beads and a flashy button complete your bracelet and give a trendy edge to your arm. With a clasp bracelet, you will find it more convenient to wear or remove without applying undue pressure on it. Throw on a unique cuff bracelet embellished with leftover buttons for a bolder transformation of the wrist. Cut little pieces of fabric and wrap it around the buttons and then glue them onto an elastic strap. Isn’t it a far better style of wearing a bracelet? Encircling the wrist and adding some warmth as well the gorgeous knit bracelet is a must-have in your winter accessories collection. Here, a bracelet form is bent into a cuff shape, and the necktie is slipped followed by sewing the ends with the button. Only the seven colors of the rainbow wrapped around your hand can create a kaleidoscopic effect. Ravishing in every aspect, the bracelet would look great when paired up with a casual tee and a pair of denim. Have you already picked the bracelet that appealed to the eyes the most? Spice up the otherwise boring weekend afternoons hosting an all-girls craft party and making these ultra-cool wrist accessories.